We spent the night in Barstow, a small town at a transportation crossroads east of LA. Housed inside historic Harvey House Railroad Depot is a Highway 66 museum and Western America Railroad Museum, which includes an outdoor displays next to a busy railroad shared by Burlington Northern Santa Fe and Union Pacific companies. 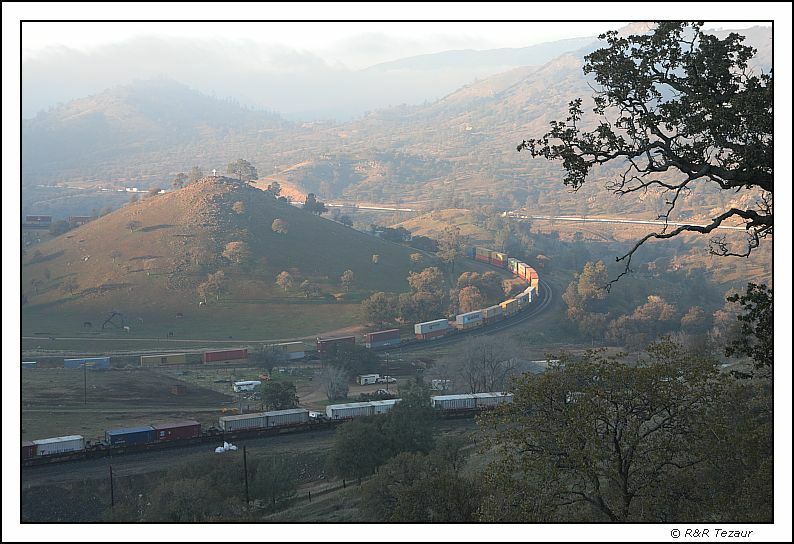 We saw some trains of 140 cars, many with double-stacked containers, towed by up to six locomotives. The freight rail traffic is alive and well. Later, we drove into the Barstow classification yard and by the BNSF maintenence facility. Then, we continued through Mojave desert to Tehachapi, where we stopped to see a railroad engineering marvel, the Tehachapi Loop.